Horses add to the turn-of-the-century ambiance on Main Street USA in the Magic Kingdom. 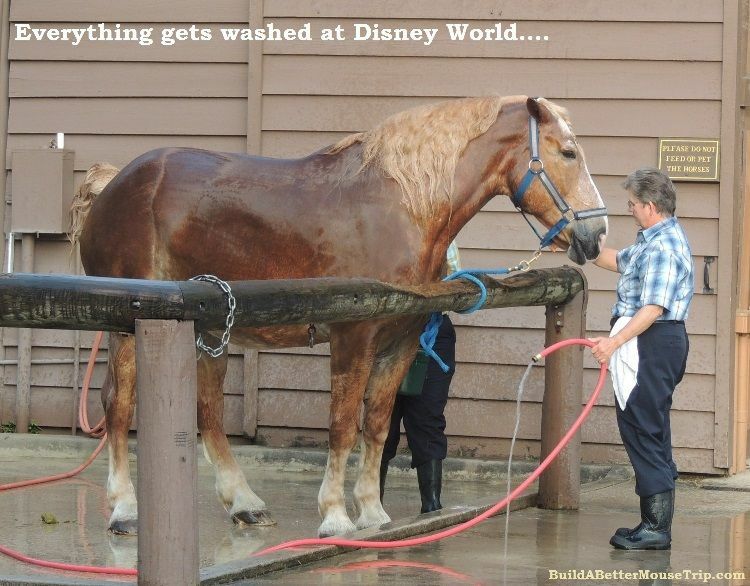 You can catch an old fashioned Horse Car – a trolley pulled by a draft horse – in Town Square or in front of Cinderella's Castle (pictured above) Horses are sometimes a part of certain special event parades in the Magic Kingdom. Horace Horsecollar often puts in an appearance in parades or at the Frontierland Hoedown. Tri-Circle-D Ranch at Disney's Fort Wilderness Resort and Campground - This is a wonderful area and a great free activity. Guests are welcome to visit and see Cinderella's ponies and the beautiful horses that appear in parades or pulling trollies along Main Street U.S.A in the Magic Kingdom. You might even be able to see the blacksmith at work making horseshoes and shoeing horses. Step into the barn and see the Dragon Calliope, a horse-drawn musical instrument purchased by Walt Disney. Guided trail rides are available daily from the Tri-Circle D Livery at Disney's Fort Wilderness Resort and Campground. Because the tempo is kept to an even walk, experienced riders might find this a bit plodding for their tastes but it is perfect for inexperienced riders who have been dreaming of taking to the saddle. Long pants and close toed-heeled shoes are required.. Riders must be at least 9 years old and 48-inches tall or taller. There is a maximum weight allowance of 250 pounds. The trail ride lasts approximately 45 minutes and cost $46 per person. Reservations can be made up to 90 days in advance by calling 407-WDW-PLAY (939-7529). Pony Rides - Children too young for the trail ride may enjoy the Pony Rides available at the Tri-Circle-D Ranch at the Fort Wilderness Resort and Campground. No reservations are required. Pony rides are available from 10 AM – 4:30PM and cost $5 - $8 (cash only) + tax. Riders must be over age 2 and less than 80 pounds, no taller than 48-inches and able to hang on by themselves. to ride. A parent or guardian must lead the pony at all times. Wagon Rides are available at 6:00PM and 8:30PM nightly at the Fort Wilderness Campground and Resort. The 45-minute rides depart at 7:00PM and 9:30PM from in front of Pioneer Hall. Cost: $8.00 per person age 8 and older, $5.00 per child (ages 3 – 9). Children under 3 are free and all children under 9 years old must be accompanied by an adult. Advance reservations are not available. Group wagon rides for 30 - 35 guests are available for $300 and can be reserved with 24-hour notice by calling 407-824-2832. This is a nice activity to do in conjunction with the Campfire Sing-Along with Chip and Dale and Free Outdoor Movie. Horse-drawn carriage rides are available from nightly from 6:00PM – 9:30PM at Port Orleans Riverside Resort (check in at the Riverside Levee Marina) and at Disney's Fort Wilderness Resort and Campground (near Crockett's Tavern at Pioneer Hall). Up to four adults or two adults and three children will fit in the carriage. You may bring your own beverage on the carriage. Reservations for the 25 minute rides are suggested and can be made up to 180 days in advance by calling 407-WDW-PLAY (939-7529). $45 fee charged for no-shows or cancellations with less than 24 hours notice. Walk-ups are permitted but drivers cannot accept credit card payments. Cost: $45 per carriage, not per person. Holiday Sleigh Rides - Another great seasonal carriage ride - this one is offered in November and December. It is a very rare thing for Florida to get snow so your "sleigh" has wheels hidden behind its runners. Holiday sleigh Rides depart from the main entrance of Crockett's Tavern at Disney's Fort Wilderness Resort & Campground. Cost: $64 per carriage. Make your advance reservation by calling 407-WDW-PLAY (407-939-7529). 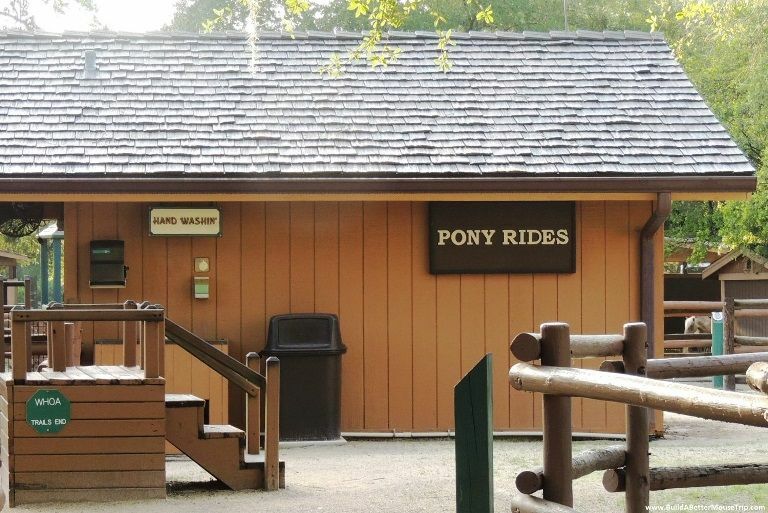 Disney's Fort Wilderness Resort and Campground / Cabins & Camp Sites - It is pretty obvious from the information in this article that Disney's Fort Wilderness is a great spot for horse lovers. The cabins can sleep up to six guests plus one baby in a crib and have full kitchens. The campsites can accommodate up to 10 guests on one site. Disney has three resort categories - value, moderate, and deluxe - and this is considered a moderate resort location. You cannot bring your own horses, however; there isn't any place to stable them. There are camping loops that allow dogs (extra fee). There is so much to see and do that some people stay at Fort Wilderness and never even go into the theme parks. 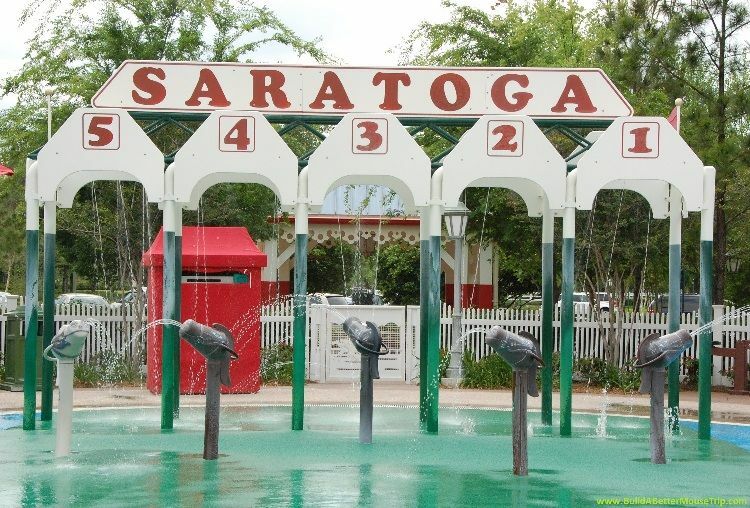 Disney's Saratoga Springs Resort is designed to resemble New York's famous Saratoga Springs resort area. There is a “Health, History, Horses” theme throughout the whole resort complex. The resort's check-in area is called the “Carriage House” and is adorned with a horse weather vane. 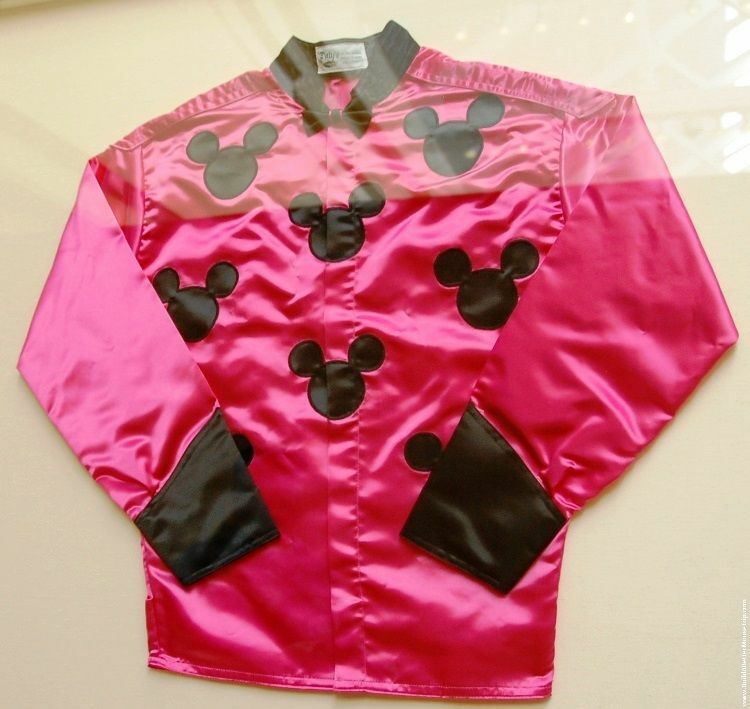 The décor has a distinctly equine feel and the cast members' uniforms resemble jockeys uniforms. Names like The Paddock Grill or the Turf Club continue the theme. Disney's Saratoga Springs Resort is a Disney Vacation Club (DVC) property but guests may book accommodations at this hotel just like any other Disney hotel. 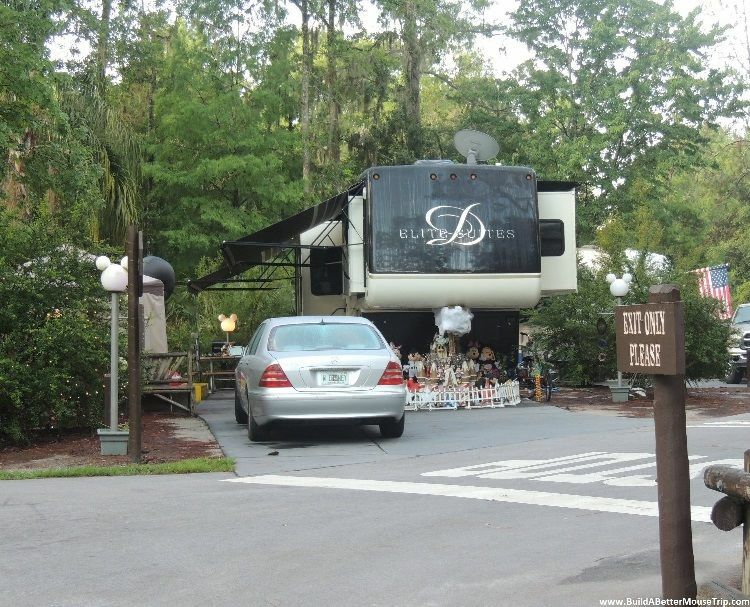 While this is a deluxe level resort - Disney's Saratoga Springs and Old Key West Resorts - are the two least expensive resorts offering "home Away From Home" accommodations that include full kitchens and multiple bedrooms.